Trump Affirms Support For MbS, Warns "World Is A Dangerous Place"
After promising to publish a "very full report" about the CIA's findings related to Saudi Crown Prince Mohammad bin Salman's complicity in the death of Saudi journalist Jamal Khashoggi, President Trump on Tuesday instead released a statement where he once again defended the US's relationship with the kingdom, and questioned whether MbS even knew about the killing. While Trump described the murder as a "terrible" and "unacceptable" crime, he claimed that as US intelligence agencies continue to investigate, they could still find that MbS wasn't responsible for ordering Khashoggi's murder. 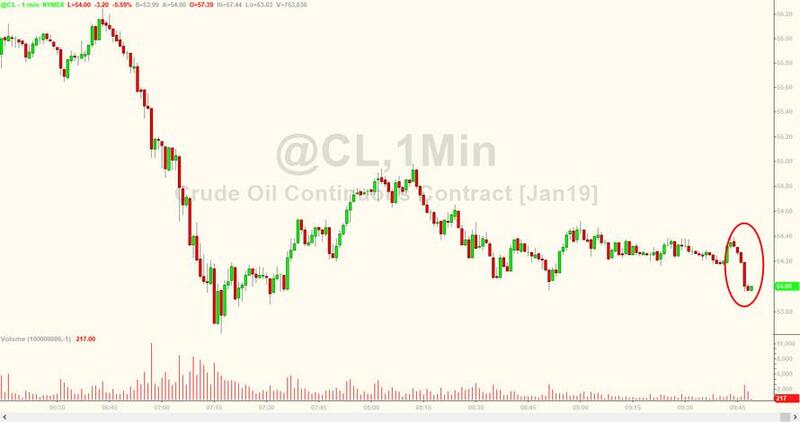 Oil prices moved lower on the statement as investors interpreted it as just another sign that the US won't follow through with any material sanctions or other punitive measures against the kingdom itself (though the Treasury Department did sanction 17 individual Saudis, including a senior aide to the prince, over their alleged involvement. Presumably, as long as the kingdom does everything in its power to keep oil prices low, Trump won't give them any problems. After my heavily negotiated trip to Saudi Arabia last year, the Kingdom agreed to spend and invest $45c) billion in the United States. This is a record amount of money. It will create hundreds of thousands of jobs, tremendous economic development, and much additional wealth for the United States. Of the $45 billion will be spent on the purchase of military equipment from Boeing, Lockheed Martin, Raytheon and many other great U.S. defense contractors. If we foolishly cancel these contracts, Russia and China would be the enormous beneficiaries - and very happy to acquire all of this newfound business. It would be a wonderful gift to them directly from the United States! The crime against Jamal Khashoggi was a terrible one, and one that our country does not condone. Indeed, we have taken strong action against those already said to have participated in the murder. After great independent research, we now know many details of this horrible crime. We have already sanctioned 17 Saudis known to have been involved in the murder of Mr. Khashoggi, and the disposal of his body. Representatives of Saudi Arabia say that Jamal Khashoggi was an "enemy of the state" and a member of the Muslim Brotherhood, but my decision is in no way based on that - this is an unacceptable and horrible crime. King Salman and Crown Prince Mohammad b. Salimn vigorously deny any knowledge of the planning or execution of the murder of Mr. Khashoggi. Our intelligence agencies continue to assess all information, but it could very well be that the Crown Prince had knowledge of this tragic event - maybe he did and maybe he didn't! That being said, we may never know all of the facts surrounding the murder of Mr. Jamal Khashoggi. In any case, our relationship is with the Kingdom of Saudi Arabia. They have been a great ally in our very important fight against Iran. The United States intends to remain a steadfast partner of Saudi Arabia to ensure the interests of our count, Israel and all other partners in the region. It is our paramount goal to fully eliminate the threat of terrorism throughout the world!